Customised performance for some of the world’s most legendary hypersport machines. 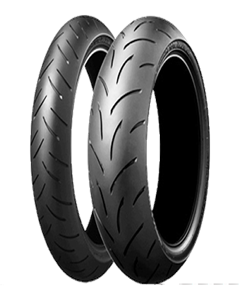 The Battlax BT-015 covers a wide range of OE fitments to meet the specific demands of high-powered hypersport bikes. Optimised for a range of bikes with high power-to-weight ratios, the Battlax BT-015 delivers true acceleration and braking response coupled with outstanding straight-line stability. Feel the difference of precision response and high-speed stability particularly on winding roads. Rich contact feel, even during high-speed manoeuvring, gives you the grip you need to extend the boundaries of your high-performance bike. Good feedback, excellent cornering and cruising stability and superior wet grip ensure maximum safety in all conditions.